Breakbot's By Your Side is as smooth as modern funk gets. The record keeps an old, "your mom and dad's record" vibe to it with its incredibly vintage production, The record is never overbearing with its arrangement. It is funk, with piano and fat bass throughout. Chromeo have been longtime proponents of new funk, specifically a subdivision called electro-funk, due to their use of synthesizers and a talkbox. Each record Chromeo has put out has been progressively more accessible and pop without compromising on the funk at heart-- it's as if Roger Troutman of Zapp and Hall & Oates magically had two children of their own. How are these two related though? Well, for one, there's awesome "When The Night Falls" remix by Breakbot (heard below). Chromeo and Breakbot also toured the US last year together, with Breakbot opening the night with a DJ set. Finally, they all make a rare breed of music in this day and age: retro, yet modern, funk. Chromeo has always gone for a certain vintage sound, but it has always been limited to the synthesizers, riffs, and vocal stylings-- I would say every record they have sounds modern in its production and mixing. It's not a bad thing by any means, but it doesn't sound like By Your Side, which in my opinion, is the way to do retro. Chromeo has their pop edge on their side though-- they get great coverage by the press, play on David Letterman, and show up in Future Music magazine. Breakbot, however, is still growing in popularity. While he's widely known on the scene, he's not exactly at the breakthrough part in some aspects of the industry, despite all his talent. For all his funk expertise, he rarely ventures too far into pure pop, which Chromeo does exceedingly well with songs like "Mama's Boy" and "Needy Girl". These two together would change modern funk-- a Chromeo record produced by Breakbot would blow many a mind open. The pop sensibilities and synth heaviness coupled with the inherent "play me on vinyl!" 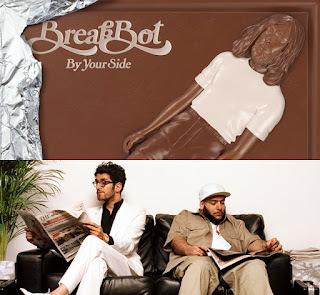 quality of Breakbot would be a match only rivaled by peanut butter and chocolate together. While this isn't really a possibility for Chromeo's next record, which is due out sometime next year, perhaps the stars will align on the next album cycle, and we'll have the perfect funk record for years to come. But for now, I'll be dreaming.